The Museum of African American Art has supported African American art and culture for 40 years. As the Baldwin Hills area develops, the museum is expanding its influence by planning an outdoor exhibit at the future Martin Luther King Jr. Metro station, as well as opening a second museum. Off Crenshaw Boulevard and Martin Luther King Jr Drive in Baldwin Hills, visitors weave their way through the Macy’s mattress section in search of a museum. A white hallway glows from the back corner on the third floor, guiding guests to wander through the Museum of African American Art. Black letters read on a crisp white wall, “MUSEUM OF AFRICAN AMERICAN ART” and next to it, a subtle entrance entices one’s curiosity. Stepping into the dim room, shoppers and visitors are transported into a thoughtful space that appreciates African American culture. This nonprofit cultural institution celebrates African American history, “the art that is hung in the museum in fantastic because it’s the black experience. Other racial groups can contribute too, but it is mostly the black experience,” said Rachel Turo, the museum’s receptionist. The museum opened in 1971 by Dr. Semella Lewis, both an artists and an art historian, who strived to inform the public on African American culture and history. Not only does the museum have a permanent collection, but it also brings in new artists every four months to display their work. Currently artist Yolanda, “Yoyo” Lander’s show, Memories of Love, features pieces that use a lot of color and many of her works are portraits. The museum also operates like a gallery, where the featured artist’s work can be bought. The prices of Lander’s works range from 250 dollars to 6,000 dollars, so everyone can invest and appreciate art. The museum is free and open to the public thus giving anyone in the community access to art. With the extension of the Metro line, the Crenshaw/LAX Transit Project is expected to bring new frequenters to the area and more businesses. The project extends the Metro line 8.5 miles southeast to the Metro Green Line, which runs west from the 110 freeway, bringing riders from the west side, east, and riders from the east side, west. The underground station has been under construction since 2014. Metro projected that the extension plan would take four years to complete. There have been a few delays in the construction of the Metro line, which has delayed the museum’s exhibit as well. “The Crenshaw/LAX line’s anticipated opening is at the end of 2019,” said Kinya Claiborne, a LA Metro Community Relations Manager. The Martin Luther King station will be right across from the Baldwin Hills Crenshaw Plaza, and thus across from the museum. “Each of the stations will include artwork from different artists, local artists as well, and the artwork has had some community input,” said Claiborne. The Museum of African American Art grows with the nearby development. “It is going to do an outdoor venue with the Metro exhibit. The Metro exhibit will be on the North-East corner of Crenshaw Boulevard and Slauson Avenue. They’re renovating the area now, and then afterwards, after the Metro is developed, we’re going to start talking about what we’re gonna do for the Crenshaw Plaza and what the museum is doing, going forward,” said Shonari Johnson, the Logistic Director at Museum of African American Art. The outdoor venue at the Martin Luther King Jr. station will give the Metro stop a cultural touch. “We are going to set up an outdoor venue with our Palmer Hayden collection and a number of our permanent collection pieces,” said Johnson. In addition to the Metro station exhibit, Shonari mentioned the opening of a second museum location. As the Baldwin Hills area changes and faces pressures of development, the museum moves with it, and continues to support the African American culture that has been in the community for 40 years. The museum’s presence grows alongside the neighborhood with the addition of an additional venue near the Metro and a second museum location. Yoyo Lander's exhibit has been open since October 8th and will remain open until December 31st. The show reveals her love for color and her Cubism-like style. 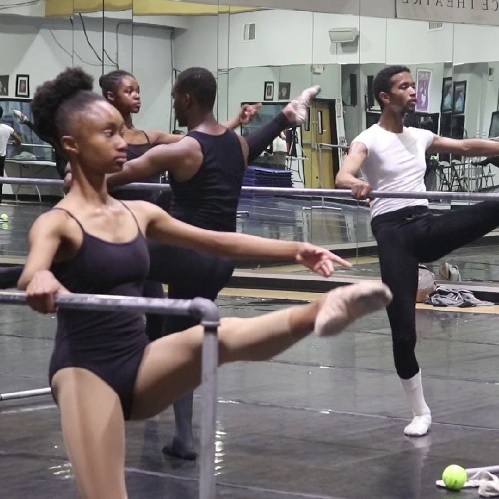 Over the past 36 years, Lula and Erwin Washington have built a professional dance company that’s traveled to Israel, Russia, Mexico, Kosovo, Canada, Spain, Germany and China. But they never forgot their roots in South Central Los Angeles. Downtown LA’s Skid Row supports temporary “city” of over 8,000 homeless residents. The area suffers from a concentration of extreme poverty unlike any other in the developed world. However, Skid Row upholds a unique “sidewalk culture” developed by its many inhabitants. 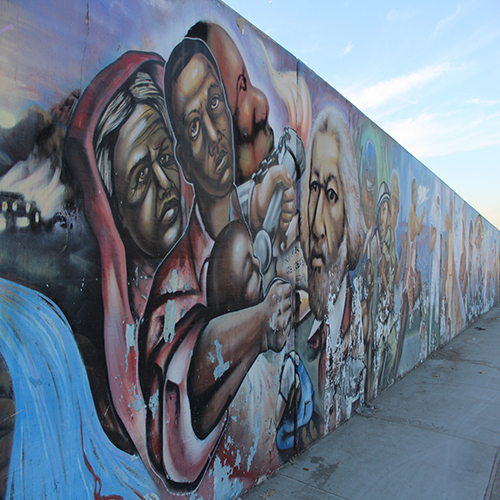 The Crenshaw Wall has brought the Crenshaw community a lot of pride but weather and some tagging have worn down the well-acclaimed wall. Now the artists behind the current mural on the wall are working on restoring it so it stays up for many years to come.